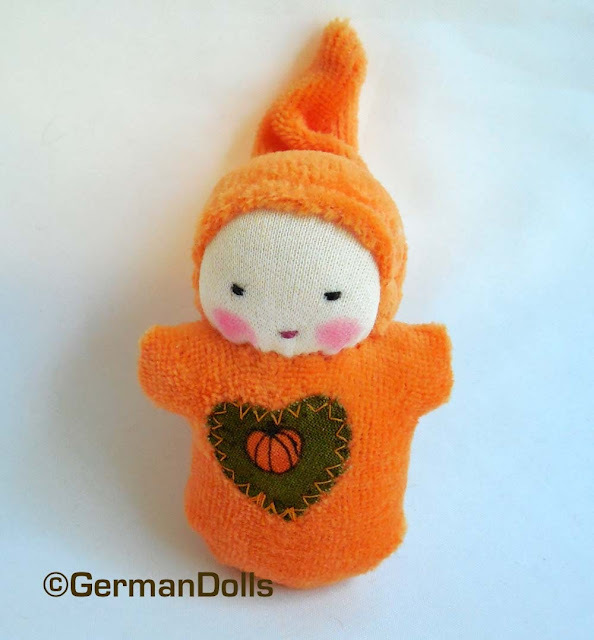 germandolls: what to do with small fabric scraps? I have been working hard on cutting down on my fabric buying and collecting. It is tough though when there is so much temptation out there. I'd call it a occupational hazard. When you are a waldorf style doll maker you just can't help it. 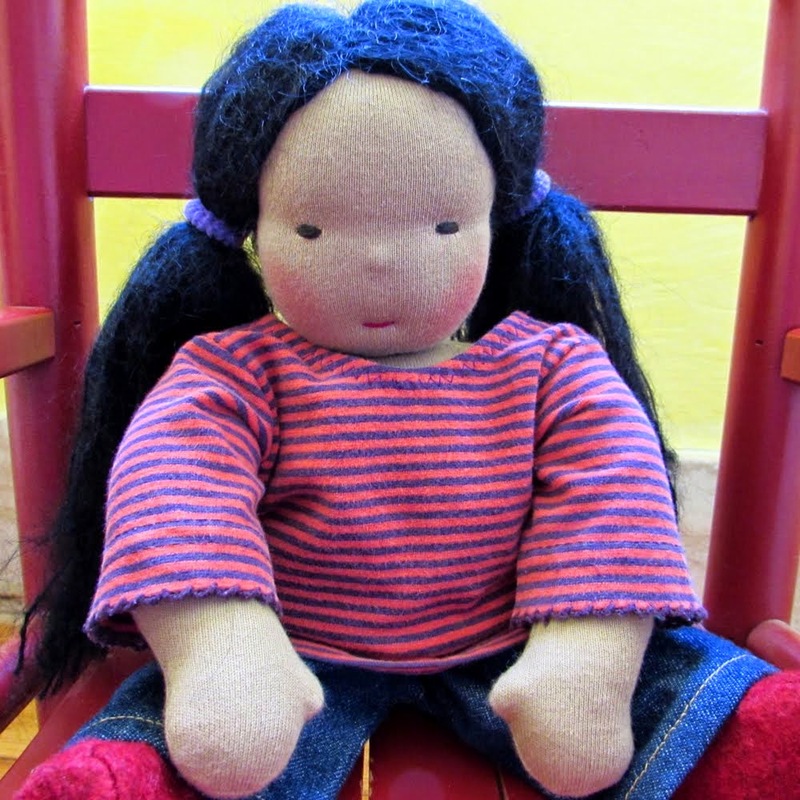 I have been making dolls for over 10 years. With each year my collection of cute fabrics has grown. I have to put on my tunnel vision when I go to the fabric store and head straight for what I need so I don't come home with more yardage. I have to stay strong and not do searches for fabric on Etsy or the Internet in general. There are entirely too many cute fabrics out there. I am proud to report that I have been rather successful in my quest this year. I actually have half-empty fabric bins at the moment. I point to them whenever my husband complains about my business taking over the whole house or grumbles about not having a dinner table to sit at. For years I have been trying to explain to the family that it's a cutting table. Who needs a formal dinner table? To stick to the topic though: what is it people do with their fabric scraps if you are not a quilter? As I have managed to shrink my pile of whole yard cuts I find that I simply cannot throw out the smaller scraps of fabric or little remnants. Our church quilting group turned them down. I did some friendship peg dolls with the kiddos at school. I also dressed card stock Easter bunnies a couple of seasons in a row. But I need more projects to use up the bags of scraps. I keep telling myself that I have to use them up or say Goodbye to them soon. Well, in the photos you can see my latest idea of using them up. 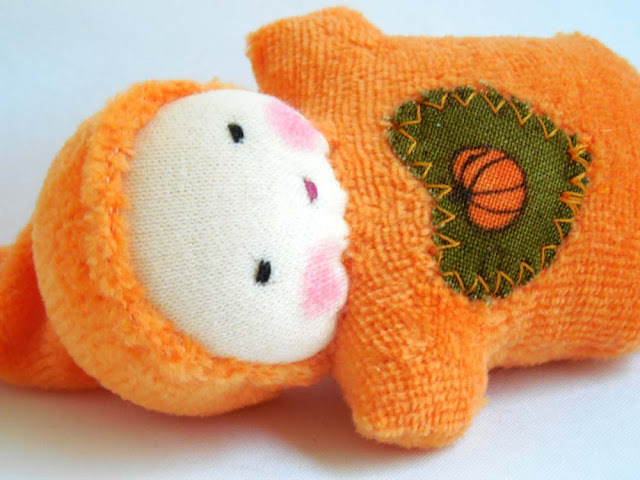 I sewed some pumpkin fabric scraps onto one of my wee pocket dolls. I think it turned out pretty darn cute. But please let me know if you have any other ideas for using up precious little pieces of fabric that are just too good to be thrown out. I hope you visit Linda's Creative Friday this week. I am always excited to see what people have come up with each week!